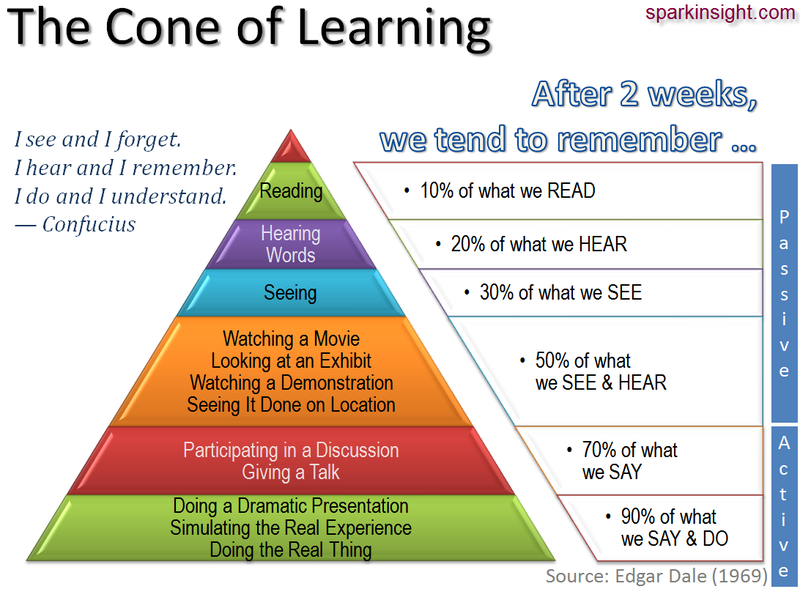 You've probably heard of the Cone of Learning or intuitively know there must be one. Edgar Dale developed it (see Audio-Visual Methods in Teaching, 3rd edition, 1969). Here's what it says: after two weeks, we remember only 10% of what we read but 90% of what we do. See the corrected Confucious quote. These simple ideas can make a profound difference in how we serve our customers and live our lives. Researchers at the University of Oregon found that what affects a person’s memory capacity most is the ability to disregard irrelevant or unnecessary details: it’s not what you know—it’s what you ignore—that might be a major factor in your success. Find what works, and do more of it. Stop doing what doesn’t work, and do something else.